Celebrate your Independence – from plates! 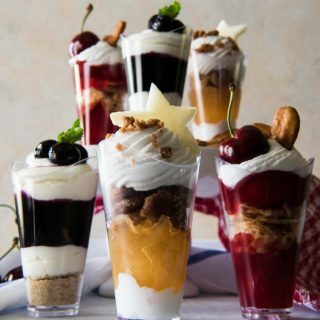 This tasty All-American Pie Shooter Trio has all your favorite patriotic flavors covered – apple streusel, blueberry cheesecake, and classic cherry. And the best part? 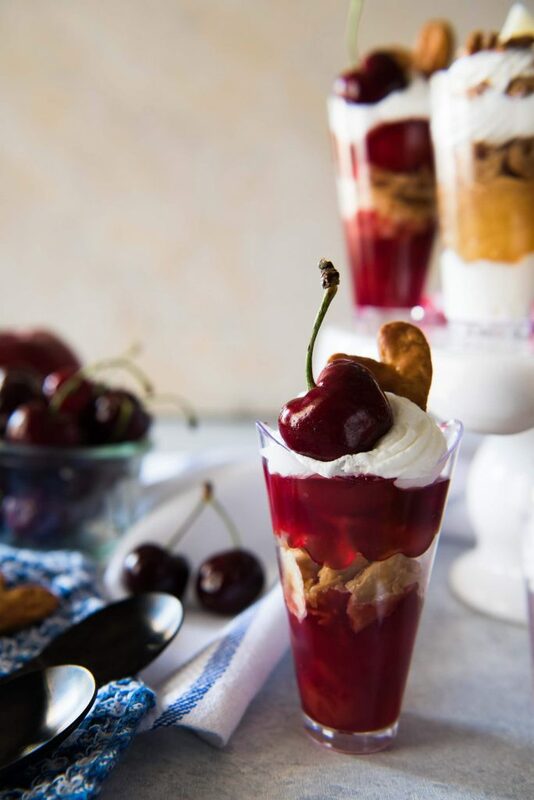 All you need is a spoon to enjoy them, making them perfect for every summer party! God Bless America…and all of the delicious little things that have come from it. I’m talking Buffalo wings, cheeseburgers, potato salad, and s’mores. You know, all those things that are bound to show up at any (Memorial Day in this case) backyard BBQ. Oh, and APPLE PIE. Actually, every pie. All the pies. Have I ever mentioned that I’m a freak for pie? I’m also obsessed with mini-sized anything (is there a name for that?) so the idea of shoving a slice of pie into a cute little shot glass is my idea of fun! JUST TAKE ME TO THE PIE SHOOTER TRIO ALREADY! 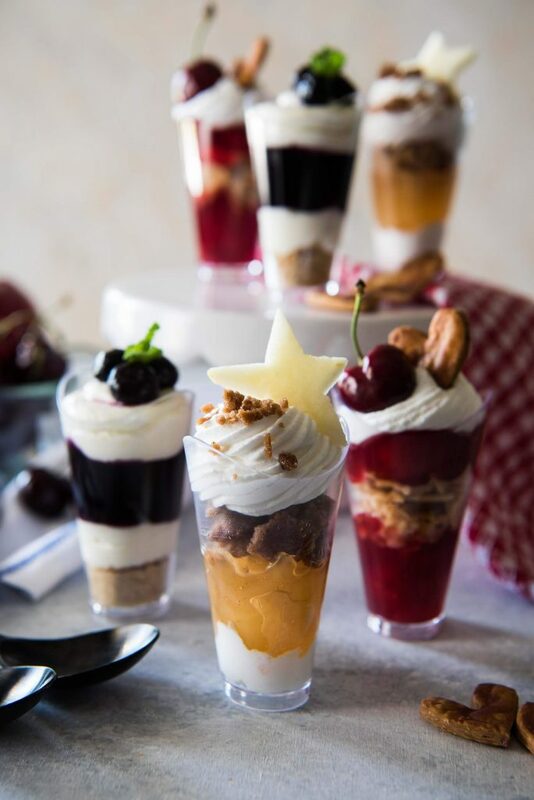 If you’d rather skip my (pretty darn helpful) tips and tricks, essential cooking info, and similar recipe ideas – and get straight to this deliciously easy shot glass desserts recipe, just scroll right on down to the bottom of the page where you can find the printable recipe card! These little guys are the perfect size to be a part of our household commitment to eating better! It’s all about portion control, folks…which is something that’s hard to come by with sweets. We’re trying the Keto Diet starting in June, so we will be mostly low-carb and as sugar-free as possible. People keep telling me I won’t even want sweets on this diet. I’ll believe it when I see it. 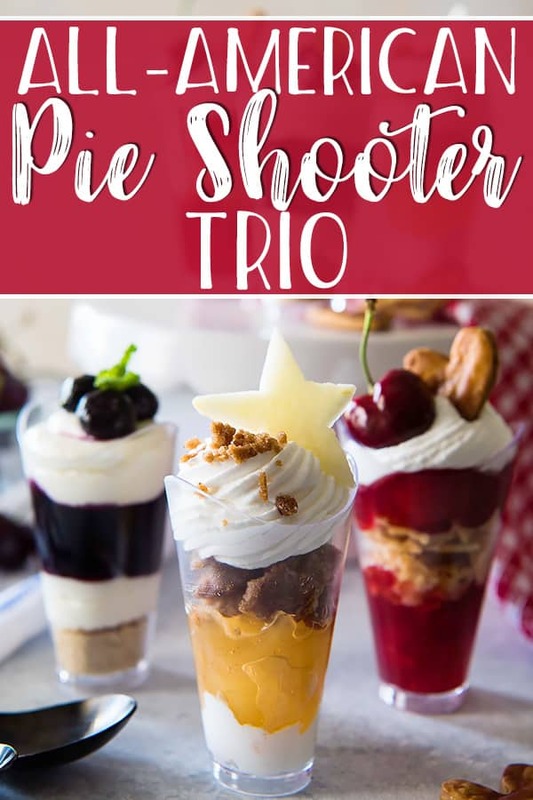 As far as this pie shooter recipe goes, there are 3 flavors and you’ll get about 8 shooters per. So don’t go making these thinking you’ll be helping out your own diet, because you may be like me and end up eating 2 or 3 at a time. 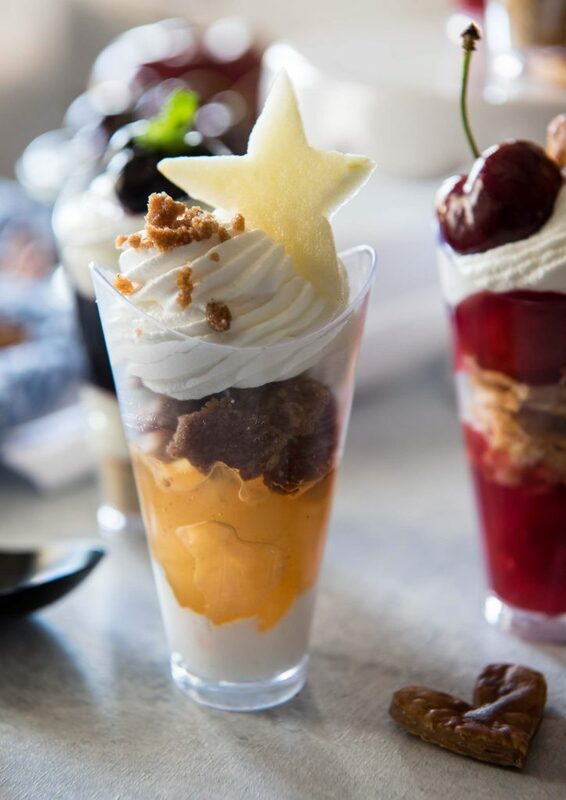 Meet the All-American Apple Streusel Pie Shooter! He’s filled with sweet apple filling (homemade is definitely recommended, but in the interest of mass production, a can wouldn’t be frowned upon,) whipped cream, and crunchy, buttery streusel. Hello! Textures! And the little lemon juice-doused apple stars on top? Take my advice and find a cookie cutter unless you’re a whiz with a knife. My stars were at least charming if nothing else. Mmmmmm. 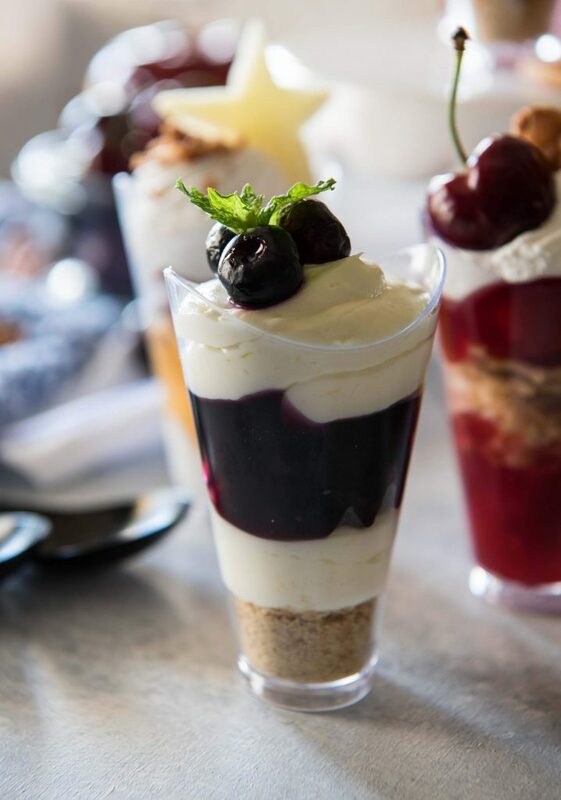 Blueberry Cheesecake Pie Shooters. Call it cheesecake only if you want, but if you’ve ever had a cheesecake pie, you’ll know exactly what’s happened here. Lemon-scented no-bake cheesecake filling, gooey blueberry filling, and a graham cracker base. Summer in a glass? Preeeeeeeeetttty much. And, of course, the Classic Cherry Pie Shooter. Because cherries are my fave, I went heavy on the filling here and layered it with freshly baked pie crust. I’m normally a crust girl, but with cherry filling, I can never get enough. It’s topped with a little bit of whipped cream and a crust heart. Honestly, what’s cuter than shaped pie crust? One of my favorite things about these shooters is how subtly patriotic they are! I’ll be the first person to slap some sprinkles on a dessert and call it festive – but using the ingredients as decorations! SO cute. SO fun. SO easy to make them fit in at any holiday party. LOOKING FOR MORE PARTY DESSERT RECIPES? Celebrate your Independence - from plates! 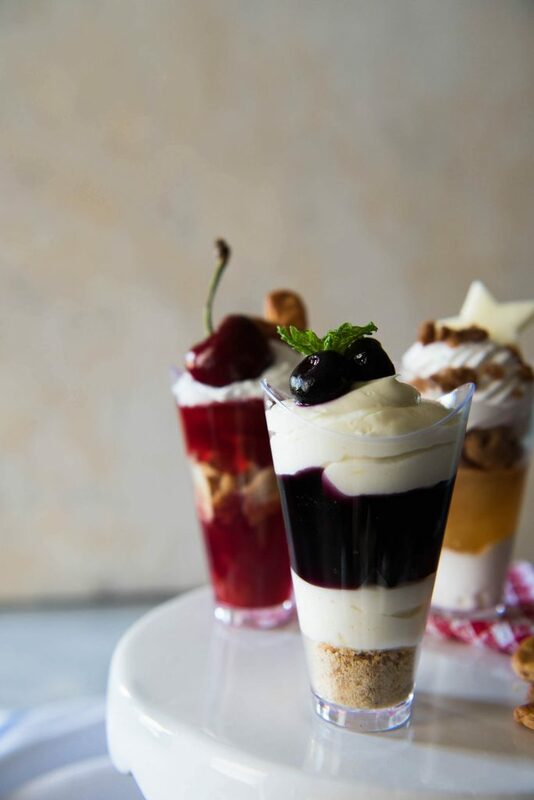 This tasty All-American Pie Shooter Trio has all your favorite patriotic flavors covered - apple streusel, blueberry cheesecake, and classic cherry. And the best part? 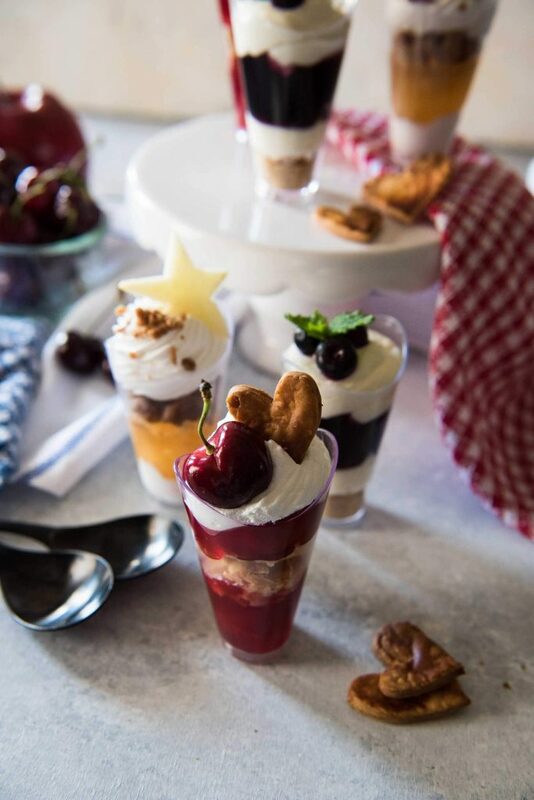 All you need is a spoon to enjoy them, making them perfect for every summer party! Apple Streusel Pie ShooterPreheat oven to 450 degrees F. Line a baking sheet with aluminum foil and set aside. Combine sugars, flour, cinnamon, salt, and softened butter in a large bowl. Rub ingredients together between your fingers until it reaches a crumbly consistency. Spread streusel on prepared cookie sheet in a single layer. Bake for 4-5 minutes until golden brown. Cool completely. Spoon or pipe whipped cream into the bottom of the shot glass. Fill halfway with apple filling, top with streusel and additional whipped cream. Garnish with more streusel and star-shaped apple slices. Blueberry Cheesecake Pie ShooterCombine cream cheese, sugar, and cream in a medium bowl, beating until creamy. Add vanilla, lemon juice, and zest, and beat 2-3 minutes until smooth. Spoon into a piping bag or zipper bag. Spoon crushed graham cracker into the bottom of the shot glass. Pipe cheesecake filling on top, then layer in the blueberry filling, and another layer of cheesecake. Garnish with fresh blueberries and mint leaves. Cherry Pie ShooterPreheat oven to 450 degrees F. Line a baking sheet with aluminum foil and set aside. Using a cookie cutter or knife, cut heart-shaped pieces from half of the pie crust. Arrange hearts and remaining pie crust on the baking sheet. Brush dough with beaten egg whites; bake for 8-10 minutes until golden brown. Immediately use a metal spatula to gently remove crust from foil, then cool completely. Break up remaining crust into small pieces. Fill shot glasses ⅓ of the way with cherry filling. Layer crust pieces on top, then fill with more cherry filling. 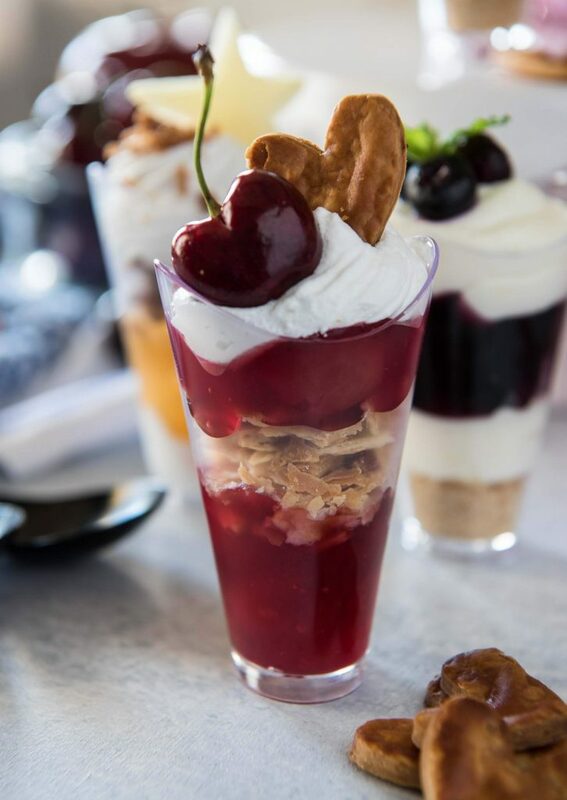 Pipe whipped cream on top, then garnish with fresh cherries and crust hearts. Get your grillin’ grub on with these Easy BBQ Recipes! 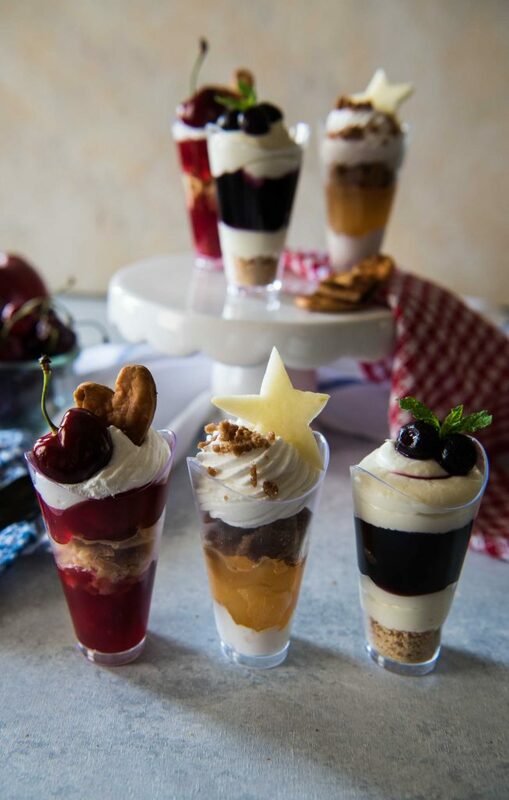 PIN THESE PATRIOTIC PIE SHOOTERS FOR LATER! These are so inviting. I would try one of each! I love the choices you have going on here! Something for everyone! How fun!! 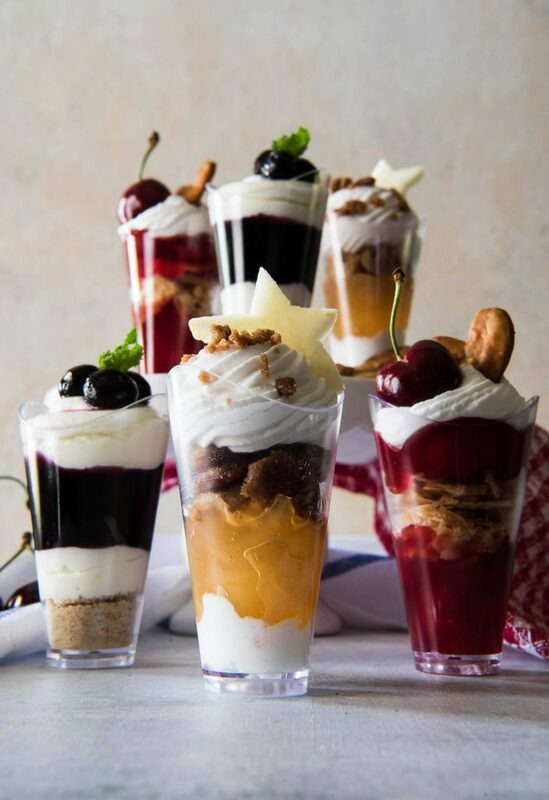 These look like the perfect dessert after a Memorial Day meal! How clever! Sign me up! These looks delicious! We seem to eat pie only in the summer and this is a great change of pace! These are so pretty, a fun idea and sound tasty too! Awww, shoot! These are some of the cutest looking desserts I’ve seen in a long time. What a hit they’d be at any gathering! !